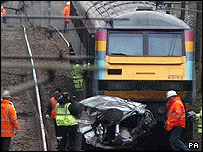 One person was killed when a 100mph (161km/h) train hit a car at a level crossing in Norfolk. The 0622 GMT One Railway service travelling from Colchester in Essex to Norwich, collided with a Vauxhall Astra at the crossing at Swainsthorpe. British Transport Police confirmed that one person in the car had died. Officers said the train remained upright and had not derailed. All services from Norwich to London have been suspended. The crossing was an automatic half-barrier type which is controlled by lights. One spokesman Jonathan Denby said: "The train was operating at its line speed of about 100mph and was about five or six miles south of Norwich when it struck a car on a level crossing at Swainsthorpe. "The train stayed on the tracks and was able to stop about a mile-and-half beyond the crossing. Thankfully, there were no injuries to those on board. There were 44 passengers on the train who were taken on to Norwich by coach. The line between Diss and Norwich was closed with coach services replacing trains. The incident comes one day after the Office of Rail Regulation (ORR) issued a policy statement about level crossings, saying they represent the biggest risk of train accidents that could kill passengers. Network Rail has started an investigation into the crash.